Information: The Syrtaki appears to be as quintessentially Greek as ouzo and democracy. But it is not. Anthony Quinn was the perfect choice to play the title role in the 1964 film "Zorba the Greek"  except for one small problem: he couldn't dance. So it was no surprise that he was unable to perform the famous dance scene with the five-step Pentozalis, as originally planned. Even the traditional Syrtos Choros folk dance was beyond him. 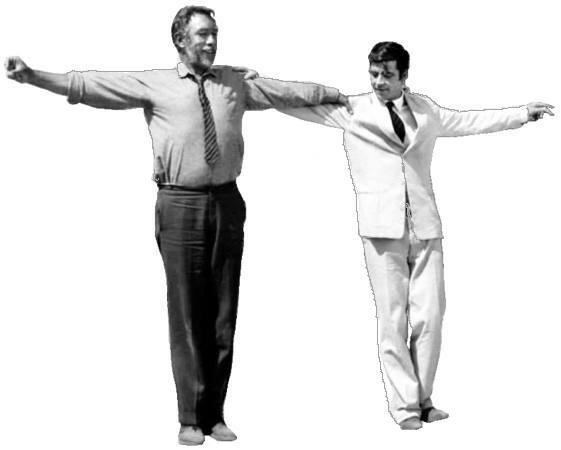 Choreographers, therefore, had to concoct a unique, extremely simple step sequence, which they called the syrtaki, or "small syrtos," set to the music of Greek composer Mikis Theodorakis. The Syrtaki combines elements from a slow Hasapiko with those from the quick-paced Serbian-inspired Hasaposerviko. The success of the Syrtaki was so tremendous that it has since become a part of Greek folklore  and a dance that even tourists can do. But Quinn admitted that even so, the camera largely remained on his upper half, as most of the time he wasn't dancing at all! From the January 1, 2012 issue of GEO Finland.